Alright, hopefully you’ve read my comprehensive two part review of Star Wars, but if you haven’t, you can at these links. As for The Empire Strikes Back, I will not be going as in depth or doing two parts. Much of what is good or special about Star Wars (the technical aspects, the score, the archetypal, easy to understand story, The Force as a pan-religious stand-in that’s also basically space magic) is universal across the trilogy and I’m not going to retread material I just worked on a week ago. So that first Star Wars movie turned out okay, huh? Anyway, while sequels weren’t as much of a given in the 1970s as they are now, George Lucas always intended to continue his saga. 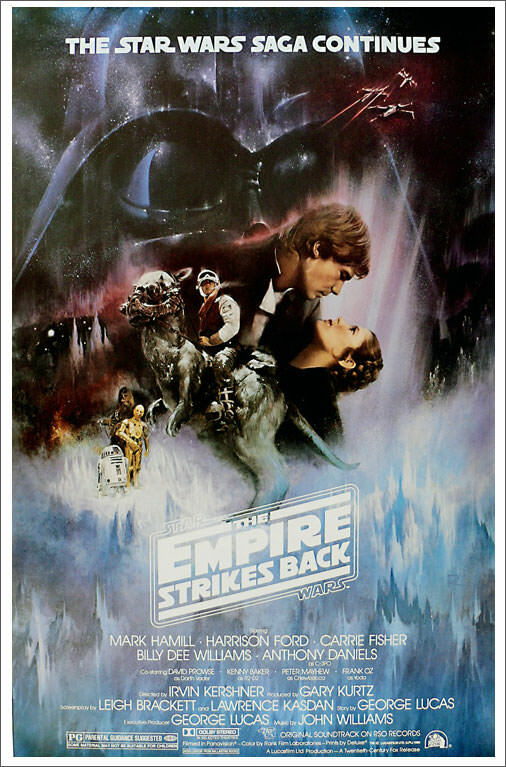 The Empire Strikes Back wouldn’t have to deal with budget concerns or a troubled production like the first movie. It was guaranteed to make money, but as it turned out, not as much money as the original. General audiences weren’t as inclined to return to theaters for a movie with a downer ending, and initial critical consensus was that it just wasn’t as special as the first film. Now, as a guy who just turned 28 last month, I have no frame of reference for what it was like to wait three years for resolution to Empire’s cliffhangers. I could always pop the next VHS in. So, while I acknowledge that my view of Empire has an advantage in that regard… I really love this movie. I mean, I love Star Wars too, but I honestly don’t know if I would love it as much without its connection to The Empire Strikes Back. When I think about Star Wars in the abstract, my mind always goes to images from this movie. So let’s take a look. Right away, Empire is a huge step up in presentation. It isn’t as groundbreaking, but the art is perfected. 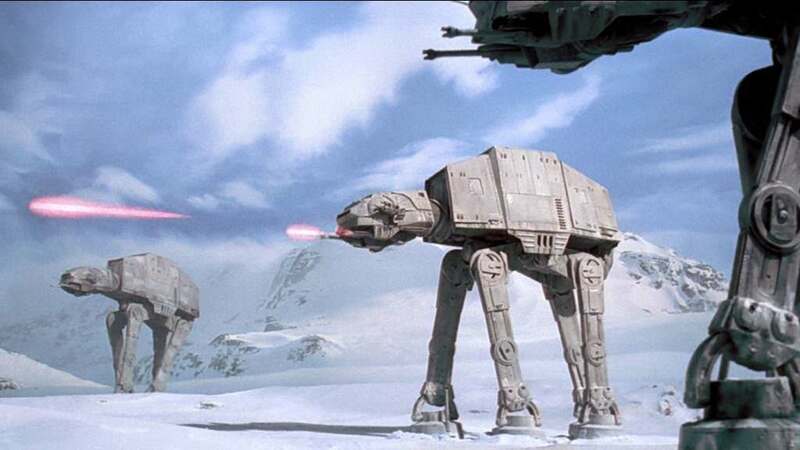 Compare the Death Star climax of the first movie with the Battle of Hoth or the asteroid field chase and there is no doubt what is more impressive. The same applies to the set designs, particularly Dagobah but also the Rebel base on Hoth and Cloud City’s corridors that play host to an infinitely better lightsaber fight. Director Irvin Kershner and cinematographer Peter Suschitzky also know how to shoot environments to make scenes visually striking, and this is easily the best looking movie in the original series. And John Williams matches his original score with the iconic Imperial March, Yoda’s Theme, and the Asteroid Field among others. But Star Wars has never just been a technical showcase. The characters and their friendships is what is most important. Honestly, every major story thread is about how the main characters put each other before themselves. The first twenty minutes Han refuses to leave and settle his score with Jabba until Luke is safe. He then spends the rest of the movie prioritizing Leia’s safety above his own, right up until the moment he is frozen in carbonite. Leia in turns learns that it’s okay to stop being the leader of the Rebels every second and pursue her romantic interest in Han. She also risks her safety to save Luke at the end. Luke abandons his Jedi training to save his friends. No matter how pressing their other concerns, nothing is more important to these three than each other, and that is demonstrated in their actions. And if you wanted to know why people love these characters, that’s about as clear a reason as you can get. That warmth is important, because our heroes are relentlessly kicked around by the Empire in this, with only brief moments of hope allowed. Empire is also where Darth Vader truly comes into his own as a character. No longer on Tarkin’s leash, he doggedly pursues Skywalker, ruthlessly kills his own officers when they fail him, marches around to a badass theme and overpowers Luke both physically and psychologically. 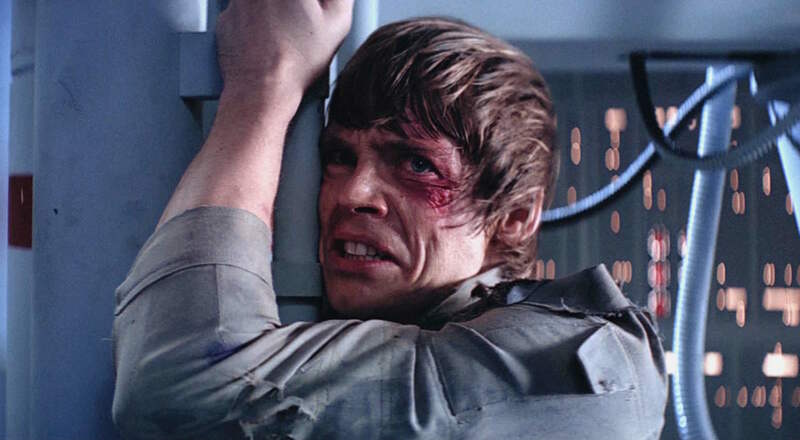 But we also see him vulnerable for the first time; he kneels subserviently to the Emperor, but shows a surprising element by wanting to turn Luke to their side rather than kill him. We see his lack of humanity highlighted as he talks to Admiral Piett in his chamber, separated from normal people and positioned low in the frame. And of course, the huge reveal that he is Luke’s father radically alters what was a cut and dry revenge narrative for Luke. Luke is definitely an interesting character at this point, a much more mature person but still prone to childish outbursts. His final confrontation with Vader is one of the great fight scenes because of how it tells a story. Vader is testing Luke, but while Luke is impressive (most impressive), he is still inexperienced and overmatched. Vader cuts off Luke’s hand and the lightsaber that symbolized Luke’s idea of who his father was before revealing the truth. It perfectly sums up everything about these two characters and their relationship. I sometimes wish I could forget that Vader is Luke’s dad so I could relive this moment, but hey, you can’t have everything. But it isn’t just the old guard’s development that makes Empire fun. Billy Dee Williams debuts as Han’s old pal Lando Calrissian, working as a mirror to him. At first Lando seems more grown up and responsible than Han, but he’s shown to still put his needs first under pressure, like Han in the first movie. He comes around though, reinforcing the theme of how camaraderie brings these rebels together. On the Empire’s side, we have quite a few people to play off of Vader. They may only have a few lines, but consider how novel it is that Admiral Ozzel, General Veers and Captain Needa have names and distinct personalities. Admiral Piett has an entire arch and I’m actually glad he survives the movie. And of course, there’s the bounty hunters, all interesting designs, but Boba Fett getting just enough spotlight to burn himself in the imaginations of many fans. But if we’re discussing new characters, we have to talk about Yoda. 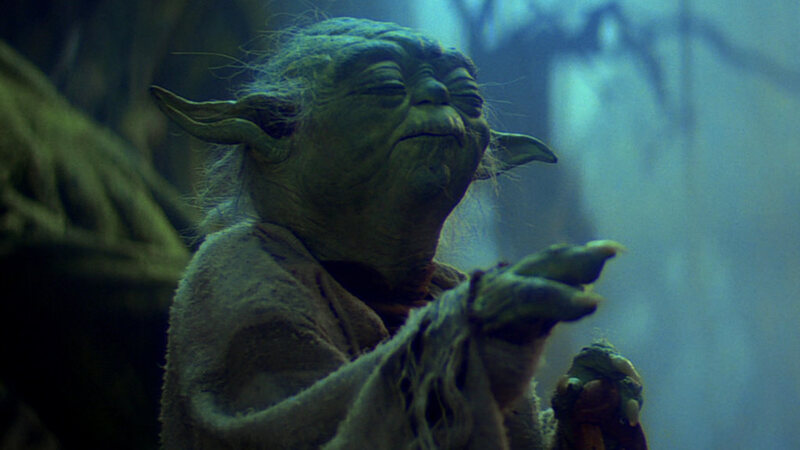 Brought to life through the amazing puppetry of Frank Oz and his team, Yoda is at once a fascinating character design and one of the most distinctive personalities in the series. He’s weird and funny when he is keeping secrets, but turns out to be a wise and motivational spiritual leader for Luke. I still get chills watching him lift the X-Wing out of the swamp. But as I’ve gotten older, I’ve noticed that Yoda is meant to be a flawed character, someone set in his old ways and disconnected from the world. He doesn’t have any meaningful relationships, and since those bonds are what define this movie, perhaps we should be more critical of Yoda’s teachings. Which just make him a more interesting character. But my absolute favorite thing in this movie is Han and Leia’s romance. There were flashes of it in Star Wars, but here, these two shine. Carrie Fisher and Harrison Ford have chemistry to burn, with their affection for each other evident when they are trading barbs and very evident in the sincere moments. Carrie played this note-perfect, with her body language showing how comfortable Leia was around Han and how she would lean into him. Consider the legendary first kiss and how poorly it could have gone if they hadn’t delivered it in just the right way. Also, take note of how affectionate they are after this; those two are in love. The “I love you.” “I know,” exchange isn’t Han being cocky, it’s him acknowledging that their time together meant something to them both and he is assured of that even as he faces possible death. 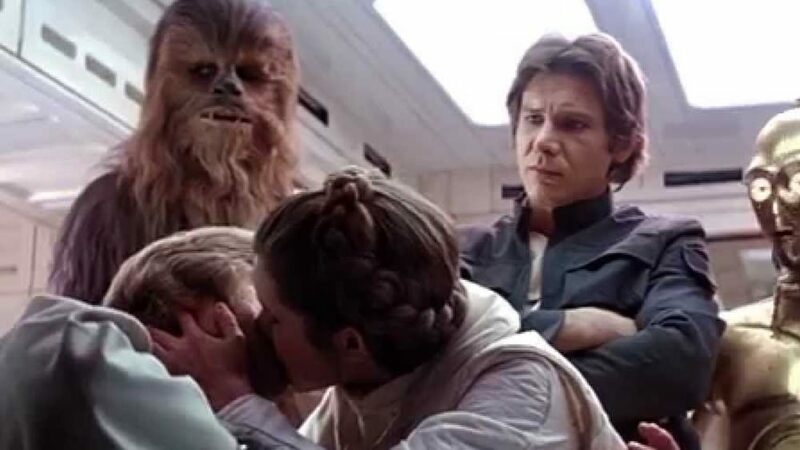 That moment puts a lump in my throat just thinking about it, and so does Leia’s face when she realizes she can’t save Han from the bounty hunter. Well, with all that gushing, I guess it’s time to take a chill pill and talk about some of the things that don’t work as well. Fortunately, it’s a much shorter list. While The Empire has a much sharper script than its predecessor thanks to Lawrence Kasdan and especially Leigh Brackett, the script is still the weakest element of this movie. Some lines don’t work at all, particularly Yoda’s line assuring Luke that he will be afraid. I also think the film has somewhat awkward pacing in the second act, and while that doesn’t bug me because I’m invested in it, I can imagine the movie playing a bit slow for some viewers. But alright, you want me to address the giant elephant in the room. Let’s talk about this scene. Okay, so yeah, that’s a thing. I imagine most Star Wars devotees are reaching for their mouthwash. But here’s the thing; it’s only awkward and gross retroactively. I don’t believe the director, the screenwriters, the actors or even George Lucas knew these two were going to be siblings. Lucas was notorious for changing things on the fly, and making Luke and Leia siblings feels like one of those writing copouts where Lucas can resolve his original love triangle idea. If I’m honest, this idea has never worked for me, and while I do recognize it for the sake of the other movies… it doesn’t really bother me that much here. Perhaps it comes from my ability to have selective canon thanks to my comic book obsession, but I tend to think of Star Wars and Empire as the only “true” movies in the series. A couple others are good, but when I watch Empire I rarely think about the movies which came after it. Obviously not everyone can or should compartmentalize like that, but that’s my sure-to-be-not-at-all-controversial take on the kissing scene. The Empire Strikes Back does everything a good sequel should do. The characters develop in new and interesting ways that make sense, the production is bigger and better looking, and we’re introduced to new alien worlds that make the galaxy far, far away feel more like an expansive universe. It has the advantage of George Lucas serving as producer, while the more talented Kershner, Kasdan and Brackett take over directing and writing duties. And it takes a big risk with a story that goes to dark places and has a huge downer ending. While that almost seems like sequel writing 101 now, it wasn’t the norm in 1980 and Empire was the least financially successful film of the series. But time has vindicated Empire. While it can never be quite as impacting as the first one, it has left its own sizable mark on pop culture. More importantly, it is the general consensus among critics and many fans that this is the best Star Wars movie. I won’t argue with that; it’s certainly the one I enjoy most and have the fewest problems with. It’s one of my go to movies when I want to be entertained. And if I’m really honest, my genuine attachment to the series as something I really love ends here. Which is not to say I don’t like the third chapter. After all, if I didn’t, I wouldn’t be coming back to this series next week. But I absolutely am. I log reviews for every film I see, when I see them. You can see my main page here. Recent reviews include Coco, Pirates of the Caribbean: Dead Men Tell No Tales, and Sergeant York.